The Wilczek Siwash Harness has been developed after extensive experimentation and expert consultations to give our customers a harness that can be adjusted to ensure a safe and correct fit on their dogs. The changes include a fixed, non-sliding forward girth belt and adjustable length rear triangle straps to ensure that the D rings can be positioned to ensure equal pressure on both straps while pulling. the dog’s head. 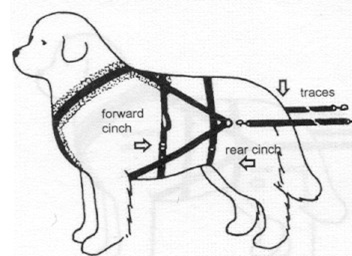 The rear girth belt is not needed when you are first learning, having your dog pull light weights, or an empty cart. triangle D rings, even pressure is distributed on the padded part of the yoke.